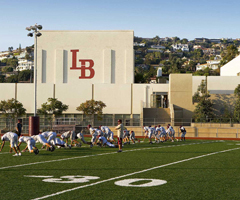 Thank you for inquiring about doing business with the Laguna Beach School District. The District is comprised of four (4) schools, serving Transitional K through 12th grade students. Providing staff and students with the products and services they need in support of student achievement and learning is one of our top priorities. We value the successful relationships we have built with our vendors and welcome qualified, professional organizations to our growing vendor list as schools or departments notify the Business Office of their intent to do business with new companies and organizations. If your company is awarded a quote, proposal, or bid, vendor information will be entered into our purchasing system, including your W-9 information, so that schools and/or departments may initiate the Purchase Order process. Please download and submit IRS Form W-9 ONLY after you have been awarded a quote, proposal, bid, or if a school or department intends to do business with your company. New vendor information will ONLY be entered into our purchasing system when a school or department expresses interest in issuing a Purchase Order to the specified new vendor.